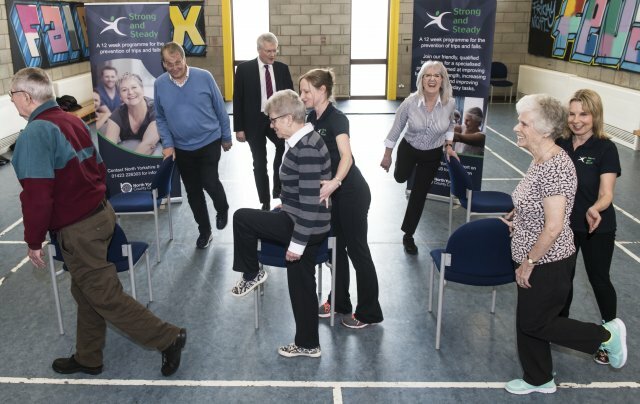 Strong and Steady is a 12-week programme designed to encourage people to become more active and reduce the risk of trips and falls. Delivered by friendly, qualified instructors, the specialised programme aims to improve balance and strength, increasing confidence and improving ability in everyday tasks. Where is Strong and Steady taking place? Thirty percent of people aged over 65 and half of those over 80 are at risk of falling at least once a year. As well as injuries, people who fall can suffer a loss of confidence and fear of falling again, loss of mobility, an increase in dependency, hypothermia, pressure-related injuries and infection. More than 166,000 people in North Yorkshire reported doing less activity in 2015 than in the previous year, due to disability, injury or poor health. Nationally, physical inactivity is responsible for one in six deaths, which makes it as dangerous as smoking. People can be referred to classes by health professionals, including their GPs, physios, specialists or from other existing clinics or classes. People can also refer themselves and will be helped to find the most appropriate class for them.